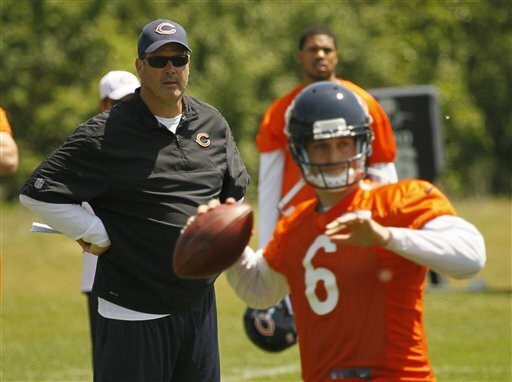 New Bears offensive coordinator Mike Tice oversees quarterback Jay Cutler. Despite nursing a knee injury Brian Urlacher goes through OTA drills. 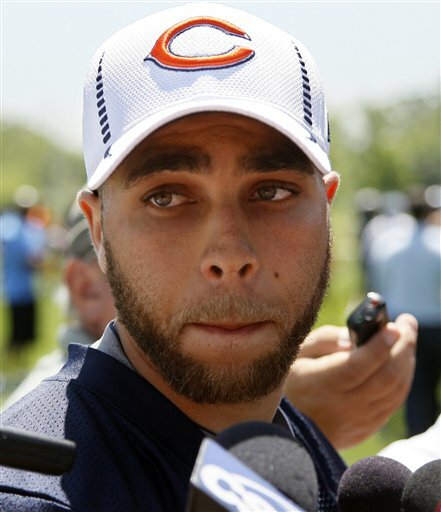 Bears receiver Johnny Knox gives an update to his spinal injury. The Bears don’t really start hitting for another two months, when the club travels down to Bourbonnais for training camp. Still, fans are already salivating for any news of their team. Starting this week the team does OTA’s (organized team activities) on the field at Halas Hall. No real hitting happens here, but it’s an opportunity to implement plays, add new wrinkles to the offense and take stock in the new personnel on the field (and those players who are missing). Not surprisingly, Matt Forte is not taking part in the OTA action. He has yet to sign a one-year franchise tag contract worth over $7 million. Forte and his agent can continue talking with the Bears front office about a multi-year deal until July 16th; after that he can only return for the franchise tag offer. Essentially, the former second round pick from Tulane can remain off the field until the season begins. After that point, he will lose money until the dispute is resolved. There are issues for both sides signing Matt Forte to a long term deal. Last year, he was involved with most of the team’s offense, and despite ending the year with a knee injury, made the Pro-Bowl. The Bears have to determine how long he will be productive at a huge salary, giving the fact that he will be entering his fifth season and the offense will likely be more balanced, with the recent moves to enhance the passing game. During the off-season the Bears signed former Oakland Raider running back Michael Bush. He takes advantage of Forte’s absence by taking first team repetitions. Besides missing Forte, wide receiver Johnny Knox was on the sidelines -- wearing a baseball cap, unable to do any activity on the field. He’s optimistic, but the reality of his severe spinal injury makes most observers believe he will not be playing any time soon…if at all. Knox said he initially lost 30 pounds and has regained ten of it. His road to recovery will be a long, long process physically and mentally. Incidentally, Knox has not viewed the replay on the hit that caused the devastating injury…probably a good idea. 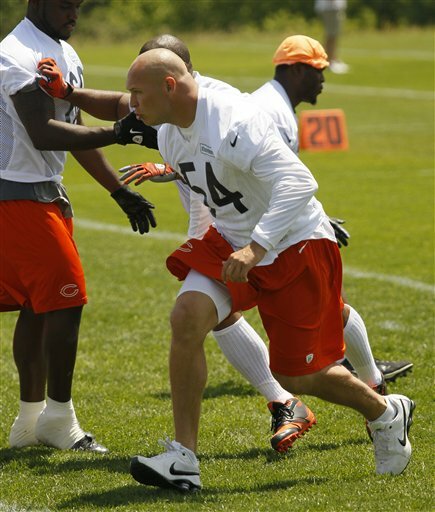 Thirteen-year veteran Brian Urlacher was on the field but was just walking through plays. He’s recovering from knee surgery, the result of an injury suffered during last season’s final game. The Bears offensive line is still missing right tackle Gabe Carimi, but he is expected to be back for June’s mini-camp. His return may be one key to the much maligned offensive line. However, if he isn’t able to go, the Bears will need to upgrade that position. Former number one pick Chris Williams is competing with J’Marcus Webb for the left tackle spot. The Bears QB seems impressed with the receiving corps, including big targets, former Denver teammate Brandon Marshall and South Carolina rookie Alshon Jeffery; he also sang the praises of Devin Hester. Cutler sees Marshall as an asset to the younger receivers on the club in preparing for games. Brandon Marshall said it has taken him seven years to mature to that role. “I recognize how important it is to bring those guys along,” he says. He will assist in route technique and help off the field. It won’t be long before Brandon Marshall feels the passion up close: Bears training camp opens in front of those fans in mid-July. And right now that group is very hungry.